Nikolaus is a young composer and a not so much loquacious P&C Seminar member: he came to Rome last year in April, to the Convegno, with some of his wonderful musical compositions. I think that he is fortunately "in the mood", in a kind of nonstop working. 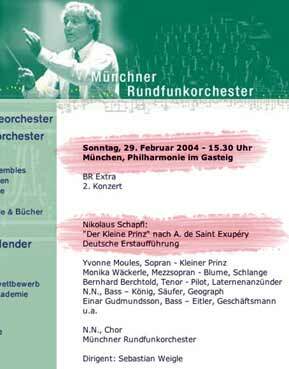 As some of you maybe have in mind, the "premiere" of the Nikolaus's Opera "Der Kleine Prinz" take place, very succesfully, last summer in Salzburg, on Sunday 24 july 2003, 8:00pm. We'll keep in mind his new adventure.